Some clients have a misconception that they can’t afford to have luxurious mailpieces that evoke a sense of high-end elegance. Or, they think that they have to sacrifice quantity for quality. We’re conditioned to believe that if it looks expensive, it must be expensive, but when it comes to high-end direct mail, that’s not necessarily true. There are a lot of ways to stretch your budget and get more than you bargained for, especially when you start with the design stage. Utilizing modern design concepts and different paper stocks can result in a piece that looks like you’ve spent a pretty penny producing it without having to break your budget. 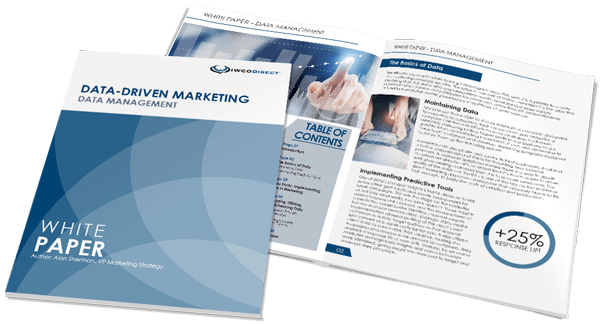 The goal of any high-end direct mail campaign is to elevate the brand. Companies like to use high-end pieces when they are not showcasing a savings message because high-end pieces are likely to be seen as a serious, credible offer. They are also more noticeable in the mailbox, which improves their chances of being opened. Creating high-end direct mail begins with the envelope. It’s especially crucial to get this step right because it is the first thing the prospect will see. Try using heavier or textured paper stocks to give the piece a unique feel and heft. You can also create intrigue by using elegant and subtle finishes such as metallic inks, foil, varnishes and soft background patterns for a dynamic effect. Unconventional package sizes are also a good way to get your piece noticed. Mailpiece inserts can also utilize heavier stocks for a rigid feel that is reminiscent of important documents like membership materials. You can also use unique folds or paper lengths to promote interaction with the mailing and help keep the prospect’s interest in the piece. Regardless of what size, paper stock or finishes you use, it’s important to stick to a clean and simple design. Excessive graphics and text become overwhelming and distract from the premium feel the lush paper stocks, special finishes and unique sizes and folds provide. Follow the example of high-end brands and allow your product to speak for itself. Keep the design streamlined and easy to navigate with plenty of white space to allow the reader’s eyes to rest. By keeping it simple, the prospect will be able to appreciate the added value of the luxury-like paper and finishes. In essence, it’s the look of the envelope that sets the standard of a high-end piece and is the area where you should invest a bit more money to get a piece that makes people take notice. The inside, on the other hand, can use clean design and simple elements to help continue the feeling of elegance and affluence. Consider testing a high-end mailing and see how your prospects react to a more elevated representation of your brand. For more input on how you can do a high-end direct mail piece for a lower spend, contact your IWCO Direct representative today. Executive Creative Director, graduate of St. Cloud State University and IWCO Direct team member for more than 17 years. Personal business philosophy: “Beautiful design is fantastic, but if it doesn’t work it doesn’t matter.” Proud father who enjoys spending time with family, golfing and is a life-long Minnesota Vikings fan.